There are a few descriptions of programmatic you’re likely to hear. It’s where ads are bought like products are bought on Amazon. It’s the method by which all advertising will come to be bought and sold like search ads on Google—auction based, with the buyer paying whatever price an ad is worth at a given moment. It’s buying specific audiences using lots of data to figure out the right ad, the right person, the right time. It’s the idea that machines will simply handle all of the process involved in buying media—the insertion orders, the paperwork, the trafficking, the spreadsheets. A few mouse clicks, and you can go home. Or, the answer could be: all of the above. 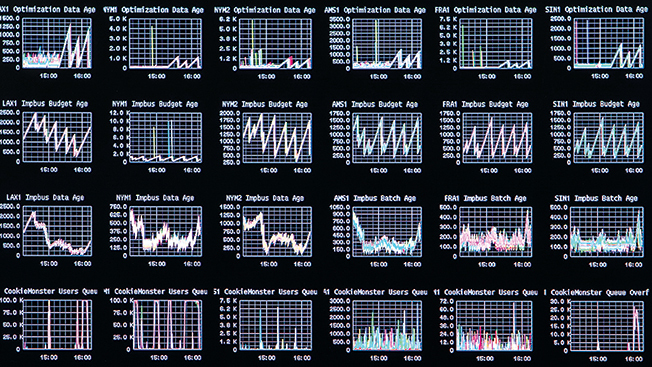 What does programmatic actually look like? Seni Thomas, CEO and co-founder of the exchange-buying specialty firm Heights Media, says programmatic means getting rid of all digital paperwork. “Instead of trafficking and marrying spreadsheets, it’s about clicking buttons and doing buys,” he says. So why wouldn’t everyone just do that now? Is there a pro-faxing and pro-paperwork lobby out there holding things up? Not exactly. When it comes to automating all the online ad world’s inherent busy work, it’s more that the rhetoric doesn’t always match reality. “This is all theory right now,” admits Atherton. Beyond automation, programmatic should be about making advertising better, some argue. “This is about selling dog food to dog owners,” as one executive puts it succinctly. So it’s like buying ads on Amazon, right? Someone wanting to buy 500,000 ad impressions aimed at dog owners in Q3 can just click here, and nobody has to get on the phone or go to lunch or ever talk to one another. In other words, there are lots of definitions, and no real consensus. It is a nascent business. —M.S. Is programmatic the same as realtime bidding? What is RTB? Even given that simple scenario, publishers had to individually traffic each ad. Buyers had little control over how often the same user would see the same ads. “And each publisher could only provide the marketer with analytics and insights based on the activity that they saw on their website,” adds Pancer. Add to that Bader’s point that media planners can only process so many sites. With the growth of the long tail, digital advertising became unwieldy, giving rise to ad exchanges. “While this was all happening, technologies came along that allowed marketers to add consumer data into the mix,” explains Bader. “This allowed the marketers to make smarter decisions about which sites to buy and which audiences made the most sense to buy. RTB was one of the first major tactics adopted as part of marketers’ programmatic solutions. It allows advertisers to buy individual advertising impressions from publishers via an auction-based system,” with machines making decisions in milliseconds. Atherton believes that RTB will eventually become the standard way that display advertising will be bought and sold, and the discussion surrounding it will fade into the background. “It will become part of ad serving,” he says. Then, the industry can focus on its bigger programmatic challenge: how to increase operational efficiency. Is there really that much operational inefficiency outside of digital that programmatic is warranted? Maybe yes, maybe no. But more and more, digital executives versed in data-driven buying are taking on leadership roles at agencies and media companies. Programmatic, in all its forms, is going to be hard to avoid. —M.S. What’s the cost structure? And does premium play a part? Many believe that programmatic buying is all about cheap, remnant inventory, where marketers pay pennies for ads appearing on unpopular Web pages or unprofessional blogs. That’s not always true, as what is generally referred to as “premium programmatic” is routinely sold at cost-per-thousand (CPM) rates from $15 (display) to $25 (video)—and in certain cases, higher rates. The ads appear on homepages or via extremely contextual placements for high-end publishers, often in the financial-content space. “Though using automation for premium inventory is growing, we believe the lion’s share of inventory sold through real-time bidding/programmatic is remnant or network inventory,” counters Clark Fredricksen, a rep at the research firm eMarketer. Indeed, premium programmatic still has plenty of maturing to do. Users can’t even decide on what to call the space, with some preferring “direct programmatic” or “automated direct” instead of premium programmatic. Here’s why some prefer to throw “direct” into the term: Many of the details on these premium buys are actually negotiated via phone and email, but then the transaction is performed through a programmatic system. How premium is premium? In terms of effective cost-per-thousand rates, according to Mahi de Silva, CEO of consumer mobile for Opera Software, the Journal’s cost for iPad placements can run between $100 and $150 through direct channels. Weiss wouldn’t comment on those figures. But for luxury brands and business-to-business marketers, the price could soon be right via automated platforms. What are the obstacles to making programmatic happen? Plenty of challenges stand in the way of programmatic’s future, from the basics of educating advertisers and publishers to more complex issues like cross-device targeting. And even programmatic’s biggest proponents say the drawbacks need to be addressed in order to capture a larger share of the ad pie. One top priority for the industry is to figure out how to move effectively in the multi-device landscape, with users migrating from tablet to smartphone to desktop and back. Cookies—an increasingly endangered product in this privacy-obsessed market—may be key to success or failure. “Marketers and agencies leverage first-party or third-party cookie data to help inform their buying, and if cookies go away, that’s a potential obstacle,” Steinberg says. Digital giants such as Facebook and Google are prepared for a post-cookie world, because they can potentially sync their user data across devices. But “if you’re a smaller player in this space then you don’t necessarily have scale, and it’s difficult to manage cross-screen activations,” Steinberg adds. How does creativity fit into this world? At first blush, data-driven programmatic advertising seems to turn a cold shoulder to the very human practice of perfecting copy and imagery. That doesn’t sit well with ad creatives, especially those who already see programmatic pecking away at their clients’ budgets. Of course, creativity isn’t going anywhere though. The art and science of marketing are going to evolve and ultimately merge with increased automation, forcing marketers to think about how their traditional and programmatic messaging follow each other like a one-two punch. Even algorithm-ruled Google is pushing programmatic creativity with a series of tools developed under an umbrella initiative called Art, Copy & Code. OneSpot is trying to get ahead of the curve, offering a programmatic platform on which advertisers can convert their branded content into targeted display ads. Unilever, Dell and Remington are among marketers testing the system. Some are crafting social media content with the idea that it will be used in paid ads via real-time bidding, Cohen says. “People who do a lot on Facebook, Twitter, Tumblr, etc., are already reasonably good at it,” he says. Starbucks and McDonald’s are standout brands to have folded creativity into programmatic efforts. For example, the coffee chain has run ads via Facebook’s exchange with copy and images highlighting the local weather. Just as traditional ad spends went through the roof in the 1950s and ’60s, programmatic growth will likely keep surging through this decade. By 2017, eMarketer estimates the space will quadruple to $8.7 billion. One thing’s for sure: Programmatic is changing creativity. “It opens the creative palette a bit,” says Razorfish’s Stein. “It’s different, but it creates opportunities.” —C.H. When is programmatic buying coming to television? Lucas points out that programmatic tends to rely on a lot of similar inventory. Television, he says, is able to thrive because it can showcase high-end content that gets sold á la carte. More importantly, though, TV ad executives have spent the last few years emphasizing the advantages of deep integrated advertising—an attractive way for advertisers to duck the ever-present menace of the DVR and boost engagement. That said, companies like Viacom do actually sell inventory on the exchanges that programmatic tech uses—it’s just not TV inventory. “We put display in there, just so we know what there’s demand for, and so we can see how the pricing works out,” Lucas says. Despite some false starts (Google TV sold ads via programmatic, but the whole project was dropped), programmatic TV is definitely happening now, at least in some corners of the market, notes Weinstein. Cable and satellite providers “seem to be the first ones coming up,” he says—among them, Dish and Comcast. (That’s local buys on Comcast, not NBCU properties). In other words, local TV inventory may offer a far more suitable opportunity for programmatic TV buying.